By Hans F.K. Günther. This long-suppressed work by one of Germany’s foremost racial thinkers was first published in English in 1927. The author, a Nordicist, provides a remarkable oversight of the concept of race, defines five different European races and discusses their physical and mental characteristics. The writer is remarkanly ciritical of the 'baltic' sub race. He then discusses non-European racial influences in Europe, the effect of environment, inheritance and racial mixture, before moving into an outline of the distribution of these races. 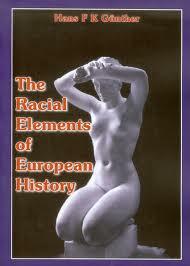 The longest part of the book is taken up with a fascinating and referenced overview of European racial history, with a strong emphasis on the role played by the Nordic subgroup. Finally he looks at the future racial situation in Europe. Although this book displays the Nordicist sentiment so common at the time, it contains many eye-opening revelations and theories, including the claim that the original homeland of the Nordic race was North Western Europe, and that Sweden is the most Nordic country on earth, whereas Germany—the author’s home—was only 55% Nordic at time of writing. This is a fascinating historical document and provides a remarkable insight into pre-World War II German racial thought. Over 300 illustrations and maps highlight racial types and historical events. Hans Friedrich Karl Günther (1861 – 1968) taught at the universities of Jena, Berlin, and Freiburg, writing numerous books and essays on racial theory. In 1931 he was appointed to a new chair of racial theory at Jena and in 1935, became professor at the University of Berlin, teaching race science, human biology and rural ethnography. From 1940 to 1945 he was the professor at Albert Ludwigs University. After World War II, Günther interned for three years before being released without charge. After the war, he continued to publish on eugenics and race.